NEW YORK – A painting of Christ by the Renaissance master Leonardo da Vinci sold for a record $450 million (380 million euros) at auction on Wednesday, smashing previous records for artworks sold at auction or privately. The painting, called “Salvator Mundi,” Italian for “Savior of the World,” is one of fewer than 20 paintings by Leonardo known to exist and the only one in private hands. It was sold by Christie’s auction house, which didn’t immediately identify the buyer. The highest price ever paid for a work of art at auction had been $179.4 million, for Pablo Picasso’s painting “Women of Algiers (Version O)” in May 2015, also at Christie’s in New York. The highest known sale price for any artwork had been $300 million, for Willem de Kooning’s painting “Interchange,” sold privately in September 2015 by the David Geffen Foundation to hedge fund manager Kenneth C. Griffin. 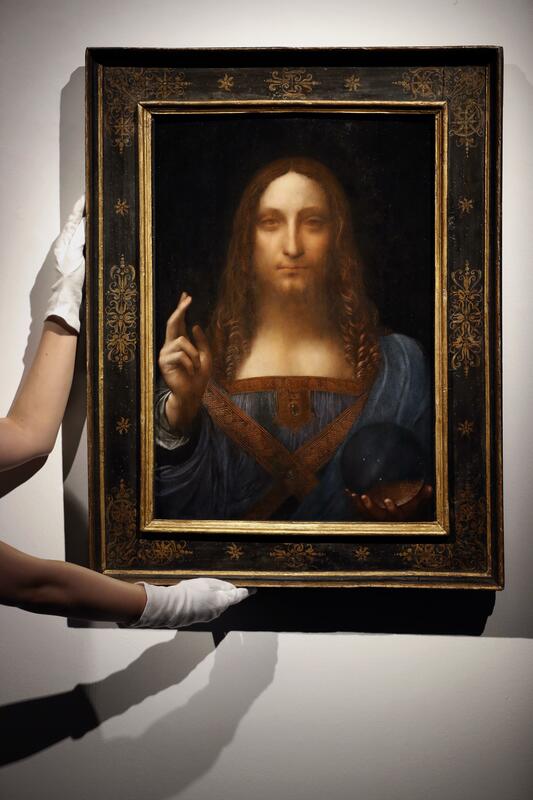 A backer of the “Salvator Mundi” auction had guaranteed a bid of at least $100 million, the opening bid of the auction, which ran for 19 minutes. The price hit $300 million about halfway through the bidding. The 26-inch-tall Leonardo painting dates from around 1500 and shows Christ dressed in Renaissance-style robes, his right hand raised in blessing as his left hand holds a crystal sphere. The painting was sold again in 1958 and then was acquired in 2005, badly damaged and partly painted-over, by a consortium of art dealers who paid less than $10,000. The art dealers restored the painting and documented its authenticity as a work by Leonardo. The painting was sold Wednesday by Russian billionaire Dmitry Rybolovlev, who bought it in 2013 for $127.5 million in a private sale that became the subject of a continuing lawsuit. Christie’s said most scholars agree that the painting is by Leonardo, though some critics have questioned the attribution and some say the extensive restoration muddies the work’s authorship. Published: Nov. 15, 2017, 5:05 p.m. Updated: Nov. 15, 2017, 5:54 p.m.